I came home inspired from that first grad class. What a way to start off. I acquired such rich knowledge about myself and other people that I could apply the next day at work. I was going on and on about it to my fiancé Michael (now husband) – a topic that piqued his interest as well. Even more exciting is knowing what I was learning would live on beyond the class. And that’s when I started to wonder how else I could leverage this. To truly reap the full benefits of this knowledge, I shared the results with my managers at work. Then I decided I would “gift” the strengths test to Michael for the holidays so he could apply this just as I had. At the time, he had just started a new job in a different industry and had many questions as to how his skills and professional goals can translate in his new role. Perfect timing it was. Then I had an epiphany. If this could enhance Michael individually, and myself individually, can you imagine what it could do for the two of us together – in our marriage? Michael and I had no intent to seek marriage counseling – we felt (and still do) that we are so openly communicative with each other that we could facilitate any of the conversations to be had in that type of session. Loriana and Patrick have been able to give us something no counselor, psychologist, or other life coach could. They worked with us both one-on-one to intimately understand our work lives and personal lives better. They also met with us together, leveraging those individual insights, to make powerful outcomes with the combination of our strengths. For example, I am extremely high in empathy and restorative, which means I can sense any problem before it even happens and have the innate ability to resolve problems effectively. Michael is very high in adaptability and context, where I am much lower on this spectrum. This means that once I’ve driven the problem solving, he leads the charge in our ability to collectively adapt to the new changes by relying on what we know from the past (context). This is simply one example. If you look at our strengths list comparatively, you’ll see some common threads between us – input, learner and responsibility are among our desktop of themes. And although some strengths that Michael has higher up are lower for me (and vice versa), that is not a product of “opposites” attract. That’s a distinct advantage that between the two of us – as one – we have almost every strength above the ground level. 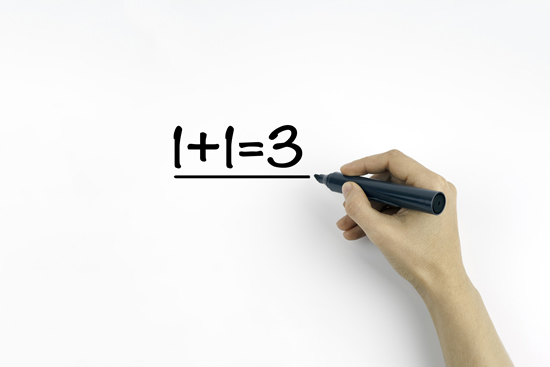 This is how you make 1+1=3. So, now we have our work cut out for us, which we continue to partner with Loriana for. How do we empower each other to use certain strengths when they are needed the most? How do two married individuals become one power couple? It’s never about ‘taking one for the team’; it’s about taking it as a team together. To say the least, this has been transformational for us both. And we are constantly talking about it at home, at work, and on the road. It has bonded us together and taken us on a journey of joint growth. We frequently get a good laugh out of it, too. Make it fun. Invest in you. Invest in your relationships – both at work and at home. And celebrate the impact of giving meaning to who you are.